Thinking about making a stunning dessert, which you can prepare in just 20 minutes? Then, this recipe is for you. Who said that you need to have at least three hours to make a stunning desert? This recipe will only take 20 minutes of your time. 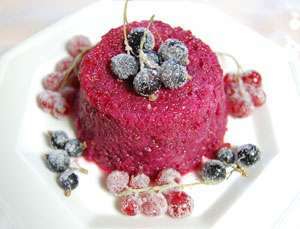 You can easily make your pudding extra special by using brioche and by serving them with frosted berries. 1. Put the berries, sugar, orange juice, and cold water (enough to cover the fruits), in a medium saucepan. Bring to boil, stirring from time to time. Set aside. 2. Using a small biscuit cutter, cut two disc of brioche which should be big enough to fit into the bottom of ramekin. Then, using a larger cutter, cut two more discs of brioche. Finally, cut the remaining bits of brioche into squares to fit up the sides of the ramekins. 3. Using a slotted spoon, transfer the fruit to a bowl. Dip the smaller disc of brioche into the fruit juice until coated on both sides. Place these in the bottom of the ramekin. Do the same with the square pieces of brioche and use them to line the sides of the ramekins. Ensure that there are no spaces between each piece. 4. Fill the lined ramekin using the cooked fruit. 5. Dip the larger disc of brioche into the fruit juice and place on top. 6. Place the pudding on a plate and cover using clingfilm before pressing it firmly. Wrap the clingfilm as tightly as possible around ramekin. Do the same for the second pudding. Transfer them to a clean plate. Weight down using a small tin of beans or similar and refrigerate until well chilled. 7. To make the frosted berries, whisk the egg white until frothy and use this to lightly coat the berries. Sprinkle caster sugar. Leave in a cool place or the fridge to dry off. 8. Once well chilled, invert the puddings using individual serving plates. Garnish them with frosted berries before serving.